Home » KFWH Community Events » Kids For World Health Celebrated Its Fifth Community Educational and Fundraising Event! Kids For World Health Celebrated Its Fifth Community Educational and Fundraising Event! Our Fifth KFWH Community Event was held on October 14, 2016, from 6:30 to 9:30 p.m. at The Hommocks Middle School in Larchmont, New York. This event included an opportunity for the community to focus on global health concerns, to find out information on KFWH chapter initiatives, to hear a panel discussion with worldwide experts, and to contribute to fundraising efforts. Our Special Event began with a high- end range of donated products and services offered at our Silent Auction which was chaired by Patrice Schwartz and aided by consultant, Joan Gansfuss, and their volunteer team. The quality items for auction included: crafted jewelry, professional signed photographs, paintings, baskets of selected children’s books and author-signed books along with services for a professional nutritional consultation, gardening design, and a vacation in Naples, FL. These were only a sampling of what our auction offered. We thank all of those who came out to support this! Ongoing during the silent auction was an array of home baked foods by the Parent Team, Brooke Mitchell, and professional baker, Anne McCarthy. It was beautifully arranged by Chairperson, Sue Gannon and her team. In the lobby, there were also tables containing information about Kids for World Health Actions: Prevention and Treatment of Chagas Disease. Fourth and fifth graders from our Murray Avenue School chapter stood at an information table wearing white doctors’ coats while explaining the treatment and prevention of Chagas. They also helped people examine the deceased carrier bugs of the parasite causing Chagas by looking at them under the microscope! 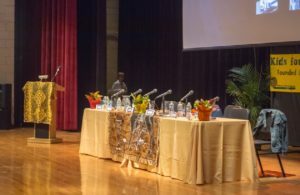 The featured Keynote Speaker was John Dau, “A Lost Boy of the Sudanese War,” along with a Global Health Panel of knowledgeable experts from the field. Aduk Gideon Dau, currently from Australia and originally from Jonglei State, South Sudan, who is a trauma survivor expert. Aine Fay, President, Concern Worldwide. Raquel Lima, Loyola University, site researcher in Guatemala. Geoffrey Miles, Peace Corps and UNICEF SASDE volunteer. Dr. Tracy Rabin, The Yale School of Medicine, assistant professor, assistant director of global health, and an internist and pediatrician at The Yale New Haven Hospital. Pamela Bolton, Panel moderator and Global Health Specialist at KFWH and Concern Worldwide. Sam Gruppo, former student and Kay Kobbe, founding teacher and administrator, both from The Chatsworth School in Larchmont. Also in attendance were two other co-founders: Graham Crawford, who acts as a consultant for policy and ideas, and Meghan Marr, who is on leave from the KFWH board while she is serving in India as a field worker. They were joined by The KFWH Board of Directors Team: Pamela Bolton, Mary Davidson, Jane Rothman, and Patrice Schwartz, and former KFWH Board members: Bill Crawford, Sheila Filipowski, and Anne Gruppo. Our program began when the audience was ushered by student chapter members into the auditorium while photographs of KFWH accomplishments in Uganda, Washington, DC, and at home in Larchmont were projetcted onto a huge screen. Kay Kobbe introduced the evening’s agenda and history of KFWH. Sam Gruppo introduced Chagas and briefly explained how KFWH Actions have grown since its inception. A representative of the Murray Avenue School chapter, Liam De LaMora, gave an articulate and interesting report on Chagas Disease. He explained the nature of this disease and its effects on villages. An excerpt from the documentary, “God Grew Tired of Us,” was shown. After the film, John Dau and his cousin, Aduk Dau from South Sudan, shared powerful and moving stories of their journeys, describing extreme challenges and attributes that contributed to ownership of their own currently successful and contributive lives. Through faith, determination, hope, and human partnership, John and Aduk inspired us with their commitments to survive and to help others in the global health world. KFWH has joined John Dau in a portion of their Action for the 2017 school year by raising funds for the construction of a KFWH Pediatric and Maternity Clinic in South Sudan at the John Bul Dau Hospital. KFWH previously raised funds to create a clinic on this site and is proud to announce this project as their sixth functioning clinic globally, servicing a potential of 1.2 million people. Following the Keynote Speaker, our panelists addressed questions concerning what makes programs successful partnerships and what has proved to empower sustainable and shared agendas as human beings? The Murray Avenue School Chapter of KFWH asked thought- provoking questions that demonstrated their understanding of the educational purpose of our grass roots organization. “Thank you,” to our donors who make our work possible and for your continued support! We wish to thank Sandpiper Fund, Inc. and Dan Scheuer who provided sponsorship for our important educational evening. The KFWH Board of Directors Team with the KFWH Student Policy Board and Members of Kids for World Health.